We wrapped up learning about the early English colonies of Roanoke and Jamestown. The children were really fascinated and engaged by these early colonies. We learned that Roanoke did not succeed. The colonists were not well prepared to make it in the wilderness, had conflicts with Native Americans, and had to have their leader return to England get more supplies. Since England and Spain were at war, John White, the governor, was not allowed to return to Roanoke for three years. Once he returned, the colonists had disappeared without much trace. The students enjoyed investigating different theories of what may have happened to the colonists. They teamed up and analyzed possible evidence pointing to what may have happened. They picked the theory that made the most sense to them and had to provide support for the theory they chose. The colony of Jamestown did succeed, but after a very difficult beginning. The children learned about the horrors of a period called the “Starving Time” and I hope they don’t have nightmares! They also really enjoyed doing an online simulation where they got to make decisions as a leader of the colony – where to settle, what kind of structure to build for shelter, how to deal with Native Americans, and so on. They got to see whether they would have survived or not based on the decisions they made; and either be promoted to governor or fired! We had a quiz on the Jamestown and Roanoke on Friday that I’m working on grading right now. So far, grades have been very good; so I think they really enjoyed this unit and learned a lot. Quizzes will come home Thursday along with some other items and grades will be updated again. IRT Field Trip – December 20th! It’s hard to believe that it is time for our field trip to IRT. As you know, we will be seeing A Christmas Carol, by Charles Dickens on Wednesday, December 20th. Since we will not arrive back to school in time for our regularly scheduled lunch, we will eat lunch in our classrooms. Your child will need to bring in a sack lunch, unless you stated on the permission slip that your child is to get a sack lunch from the school cafeteria. This has been ordered if that was indicated on the permission slip. If you are one of our parent chaperones, please arrive no later than 9:00 as we will begin boarding buses around 9:15 or as soon as they start arriving. We will be back around 1:00. Feel free to eat lunch with your child or leave when we return. Due to the unusually long morning, please make sure your child eats a good breakfast. Each child may bring in an individually-wrapped healthy snack (energy bar, fruit roll-up, etc.) to eat right before we get on the bus. Thank you. If you have any questions, feel free to contact your child’s homeroom teacher. It’s that time of year when school supplies need replenished! These are great stocking stuffers! Students should be bathing regularly, wearing deodorant, brushing their teeth daily, and wearing clean clothes. Also, students MUST have a coat for outdoor midday. Students without coats will not go outside. Around this time of the school year, student behavior, study habits, and task completion starts declining. Trimester 2 grades are reflecting this. Please continue to check the BLOG, Powerschool, and assignment notebooks regularly. Students should be bringing their assignment notebooks home NIGHTLY. What’s been going on in Room C109? We wrapped up our unit on Early European Explorers and have moved on to Early Colonies in the New World. The big concepts I hope your child came away with from European Explorers is that while Christopher Columbus was not the first European to discover America, the impact of his voyage completely changed history. Columbus wasn’t even trying to go to America; he didn’t know it existed. Columbus, like many other educated people of the time, knew the Earth was round. He wanted to sail west to go east. He just didn’t know two continents, unknown to Europeans, were in the way. Columbus may have died not even realizing this fact, but eventually it was realized that while this New World wasn’t China, it was land that represented many valuable resources itself. The race was on between wealthy European countries to send explorers here to claim land and colonize for their countries. We learned about the consequences of Columbus’ voyage and subsequent exploration – loss of land to Native Americans, loss of life of Native Americans due to diseases and war, colonization of the new land by Europeans, and global trading. Now we are focusing on early colonies – particularly English colonies. We will spend some time learning about Spanish, French, and Dutch colonies, but I tell the kids that we focus so much on England because of the original 13 colonies that became the original 13 United States of America. We are an English speaking country. It was England who we fought for our independence. Before Christmas break, we will learn about Roanoke, Jamestown, and Plymouth colonies. After Christmas break, we will learn about Spanish, French, Dutch colonies and of course the original 13 English colonies. I will try to remember to keep posting questions on the homework page so you can follow what we are learning in class and discuss it with your child. After fall break, we also started going to Media Center, now often called “Innovation Center” to participate in a project called “Genius Hour”. Miss Conrad, our media specialist, leads this class while I co-teach and provide support. Studies have shown that Genius Hour develops the kinds of skills 21st century students and adults need – creative thinking, problem solving, and innovation. Right now, students are learning about the traits of a genius and how they can develop those traits in themselves. They will be taken through the process of what it’s like to create and innovate with a sample problem, then students will be choosing a project based on their own passions. Ask your child to tell you what s/he has been doing in “Genius Hour”. You can also ask them to show you the second half of their science journal to see what they have been doing. We will attend “Genius Hour” every 8 days for 40 minute periods. When should my child take quizzes? Be sure they are reading at least 90 minutes a week for reading log. I strongly suggest every student reads 20 minutes a night, but understand that is not always an option. We have spent the last 3 weeks learning about Native American cultural groups. We studied 5 groups: Arctic, Pacific Northwest, Plains, Southwest, and Eastern Woodlands. We primarily used History of Us to read about each group and supplemented with short video clips from the Discovery Education website. I love History of Us, and we will use it frequently for the remainder of our social studies topics throughout the year as we are learning about the formation of our country. History of Us tells the story of the United States in a very engaging way. The author includes funny anecdotes and unusual facts. We are not going to do a project to culminate Native Americans because I’m anxious to move on to Early Explorers, however the students will have an open note assessment on Monday which requires them to think about the information and make comparisons between the groups to find similarities and differences – something we have been doing in class discussions frequently. The primary concepts I hope students understand about Native Americans is that each group had to adapt to the environment they lived in to survive; I want them to be able to describe how they adapted. Native Americans were very resourceful and used natural items for many purposes. We have analyzed the natural resources available in each region and studied their kinds of technology, ways of governing themselves, customs and traditions, and economic activities. I’ve also been stressing that Native Americans groups had much in common with each other, but also had unique differences. The differences are largely based on how they adapted to the environment in which they lived. Native Americans will feature broadly in our further study of American history with a focus on interaction between them and Europeans. The classes of Haywood, Phillips, and Tice will be going on a field trip to the Indiana Repertory Theatre on Wednesday, December 20, 2017. We will be attending the IRT Mainstage performance of A Christmas Carol, by Charles Dickens. This IRT annual classic is done in a very creative way and reinforces the themes of treating everyone with respect and kindness, of giving without wanting something in return, and about year-round generosity. We will be sending home permission slips and more information in the Friday Folders this week. Please watch for those and return them on Monday, if possible. The permission slip along with the money should be returned by Tuesday, November 7, 2017. If you have any questions, feel free to contact your child’s teacher. The students completed and published their personal narrative writing projects today! I am so proud of the students’ efforts and the way they all turned out. We spent two full weeks working on these, including a week of revisions. Graded papers will go home after break so please be watching for them. I hope you are as pleased with them as I was; we definitely have some future authors among us! Mark your calendars… the week of October 9th-13th we will be having a Guiding Principles Spirit Week! We want to bring more attention to our 5 Guiding Principles and what better way to do it? Monday: Get your thinking caps on… it’s Hat Day! Tuesday: Revel in academic responsibility… wear your favorite college gear! Wednesday: Exercise your honesty. Wear exercise clothes or team uniform! Thursday: Show compassion like a superhero for Superhero Day! Friday: Rockin’ Respect… wear Rocks spirit wear! I’m re-posting these notes from the homework page in case I have any kids who need to make up the quiz from Friday or for review. The Earth’s rotation on its axis causes day and night. When the Earth is facing the sun on one side (Western or Eastern Hemisphere), it is day. The opposite of the Earth is experiencing night at that time – and vice versa. The Earth’s tilt on its axis is what causes seasons. The Northern and Southern Hemispheres experience opposite seasons because the Earth is tilted toward the sun in one hemisphere during summer and tilted away from the sun in the opposite hemisphere during winter. The sun’s rays reach the earth’s hemisphere that is experiencing summer at shorter, more intense angles during the summer than in winter. Shadows change as the Earth moves in relation to the sun. Shadows form on the opposite side of a light source; so when the sun is in the east, the shadow will form to the west, and vice-versa. A shadow’s length increases as the angle at which the sun’s rays reach Earth increase. A shadow is shortest at noon because that’s when the sun is highest in the sky and at its shortest angle – 90 degrees. The movement of the moon in relation to the sun and Earth causes the moon to change in appearance. These changes are called phases. It takes about 1 month for the moon to finish one cycle of its phases. 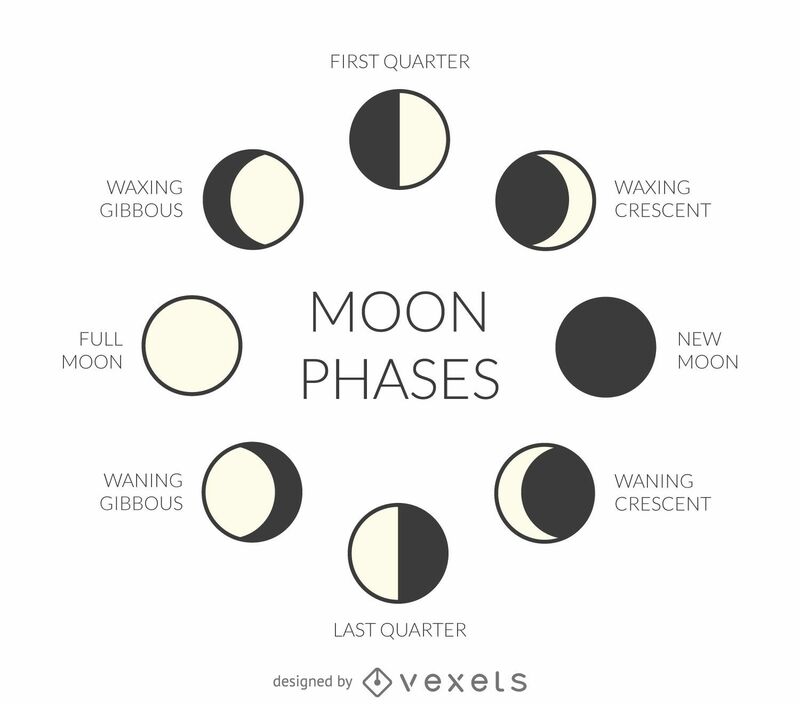 The New Moon phase begins the cycle. At this time, the moon is between the sun and Earth with the lit side of the moon facing away from Earth, so we don’t see the moon – or just see a dark shadow of it. As the moon moves through its phases, we can see different amounts lit. As the light grows, the moon is waxing and the light is on the right. Once the moon reaches its position where the Earth faces its fully lit side, (full moon) it begins to decrease in light or wane, and the light is on the left.